"...sometimes, you only have one brief moment before one of the damned monsters is on you, doing its best to drain you dry. And that's when something as simple as a quick improvised weapon comes in handy- like this one. Passed down through generations of the family, each hunter working further and further on it until it became one of the best tools you'll ever carry. White oak- soaked for seven days in a mix of holy water infused with Allium Sativum, sigils for the warding or burning of demonically-possessed flesh branded into the pommel, lines of silver and brass woven into the spike to envenom it against lycanthropes or spirits. 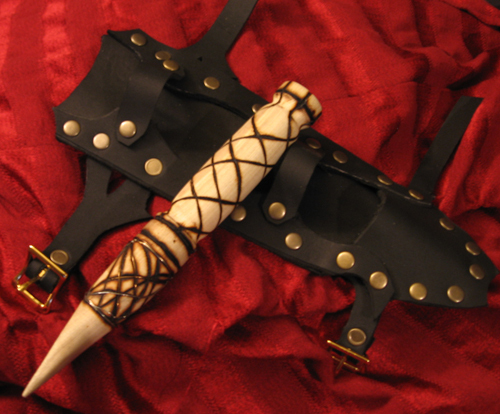 The sheath is of leather heavy enough to resist the bites of most creatures, and has been sized to work as an arm-guard for just that reason as well. All in all, this is the one tool you will promise me to never leave the house without this strapped onto your arm, young lady..."
-Discussion overheard in the Hellsing family residence, circa 1973. This one-of-a-kind, handmade piece has been sold. Iff you're interested in our vampire stakes, I encourage you to check out our new line of Vampire Hunting Accessories.